Weight loss helps improve posture, heart health, andlung function, and prevents cancer and kidney diseases. Exercise and diet are the main keys for weight loss. Exercise mainly helps in inch loss. Air Cycling: Lie on your back and lift your legs to more than a 90° angle. Place you arms on your sides and start making cycling motions. Benefit-This exercise will helpsto reducing you lower paunch. Also, it strengthens your spine, improves stamina, and aids in digestion and weight loss. Crunches: Lie on your back, bend your feet at the knees, and place them flat on the floor.Place your hands behind your neck and lift yourhead and upper back. When you lift your shoulders, it is important not to lift your entire back as it can cause strain. Benefit- Thisexercise can tone your abdomen muscles and burn belly fat. Side Crunches: Lie on your back and gently turn to your side. Place your hands behind your neck with your thumbs positioned over your ears. Lift your shouldersoff the floor just like a regular crunch. 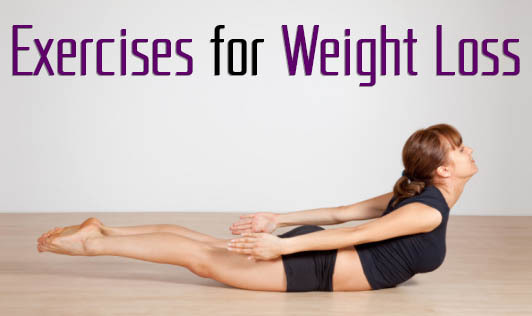 Benefit- This exercise will help in reducing fat around the waist line. It mainly concentrates on the abdomen sides. Cobra Posture: Lie down on your stomach and place both hands vertically parallel to your chest. Lift your upper body off the floor. Benefit- It helps in increasing flexibility, prevents back problems, and mainly reduces abdominal fat. Skipping: This wholesome workout benefits almost every part of the body. It improves cardiovascular health, and works all muscle groups. You may try increasing the number of repetitions gradually. But as mentioned above, diet also plays a major role in weight loss. Contact your dietitian to get a customized diet chart.